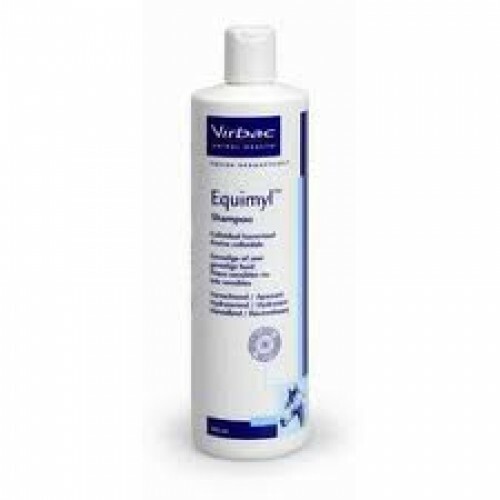 Equimyl is a special Shampoo for skin care for sensitive horses. It is suitable for animals that are prone to itching, skin allergies or summer itch. Due to its soothing and antipruritic properties, Equimyl is also suitable for the care of horses, which rub mane and tail root, damaging the long-hair - especially in summer due to insect pressure. Open wounds should be excluded from treatment. Aqua, Benzyl Benzoate, petrolatum, cetearyl alcohol, glycerin, ethyl panthenol, piroctone olamine, Polysorbate 60, Parfum. Shake before use. Apply to the previously moistened fur, spread it with a wet sponge over the body, mane and tail ,leave on for five minutes. Then rinse thoroughly with water. Not above 30 ° C. Store.